A small, simple, family-run hotel that offers a great base for those wishing to explore the beautiful beaches of South Goa. The hotel’s sought-after central location in the heart of Cavelossim. The rooms are very simple but provide a great base from which to explore South Goa. Ideally located in the centre of Cavelossim village, in close proximity to the local bars, restaurants and shops, Sao Domingo’s is perfectly placed for holiday-makers who want to get out and about, exploring the best of southern Goa. The golden sands of Cavelossim Beach are only a 10-minute walk away from this property, and it’s here that you’ll find the hotel’s own beach shack, ‘Edwin’s Leisure Place’, where you can enjoy free sunloungers and a delicious menu of seafood, Goan cuisine and colourful cocktails. Sao Domingo’s itself offers a quiet haven, with its inviting pool and sun terraces, surrounded by verdant palm trees and plants, proving the perfect setting for relaxing in the Goan sunshine. The rooms are cool and airy, and whilst simply-furnished, provide a comfortable retreat with private balconies overlooking the local area. Next to the hotel is the Goan Village Restaurant which, as well as serving a simple breakfast, also has a varied and cosmopolitan menu with delicious Goan, Indian, Tandoori, Chinese and European dishes. Here you can be entertained by local musicians whilst the bar stays open late into the evening. For a change of scenery, the famous beach of Palolem is within easy reach, as are the lesser-known, more secluded stretches of sand; Cola and Agonda. 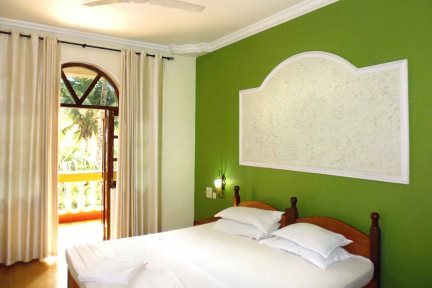 The Standard rooms are simply decorated and include a double bed or twin beds and a wet room with shower. They all have a balcony which overlooks the hotel grounds.